A woman from an indigenous community holds coffee beans grown by a cooperative in Mindanao, the Philippines, March 26, 2018. But Dubria is now one of hundreds of farmers nationwide who are brewing up a storm with training from Coffee For Peace (CfP) - a social enterprise striving to boost growers' profits, protect the environment and foster peace between communities. Having learned how to grow, harvest and process high-quality Arabica beans at a time when global demand for coffee is soaring - it is set to hit a record high this year - Dubria exports her crop to buyers as far away as Seattle for at least $5 per kilo. Marivic Dubria of the Balutakig Coffee Farmers Association tends to a coffee plant on her farm in Mindanao, the Philippines, March 26, 2018. 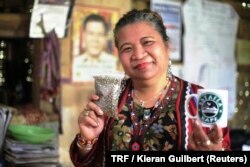 "But it's not all about the money - it's about taking responsibility for the environment and other communities," Dubria told the Thomson Reuters Foundation in her home on Mount Apo while brewing a pot of thick, aromatic, treacle-like coffee. "Social enterprise presents an emerging pathway or approach to conflict resolution," said Angel Flores, East Asia business head at the British Council, which backs companies seeking to help people, invest in the environment and tackle social ills. "Being inclusive, participatory and prioritizing community benefit over personal agendas enhances the social fabric from a place of distrust to ... confidence and mutual understanding." Dayen Cardeno processes coffee beans at a community center in Mindanao, the Philippines, March 26, 2018. While the social enterprise buys the farmers' beans above market value — selling them on to local coffee shops and exporting as far as Canada — communities can sell to any buyer, but are encouraged to demand higher prices. "We don't treat them as suppliers or just part of the chain — they are farmerpreneurs," said CfP senior vice president Twinkle Bautista. "The aim is to unite the settlers and indigenous people to teach each other, share techniques and tools ... and harmony," she added. "Our product is peace — coffee is just the tool." For Kagawad Abe and his indigenous community, setting up a processing center through CfP has brought them closer to the Christian settlers — who work with them to process their beans. "It has also brought women together, and given them a chance to work independently ... to contribute to the tribe," he said. About 80 percent of CfP's coffee-growing partners are women. "Just five or so years ago, we didn't really know each other - but now we are talking and working together," Abe added. CfP's success is likely largely due to its unusual mission, said Gerry Higgins, chief executive of Community Enterprise in Scotland (CEIS), Britain's largest agency to support the sector. "Coffee for Peace is unusual ... there aren't many social enterprises that recognize that if a community is resilient and sustainable, (then) fewer conflicts will emerge," Higgins said. By walking farmers through every step of the supply chain, CfP says they no longer see the coffee industry as "a mystery." Once dependent on traders and big brands such as Nestle, the world's biggest coffee maker and producer of Nescafe, farmers can now demand higher prices for better quality beans, CfP said. Local chieftain Baby Jerlina Owok poses for a photo with coffee beans grown by her community in Mindanao, the Philippines, March 26, 2018. "We had to convince and convince our people, many times, to move from the traditional to the technical way of doing things," said Baby Jerlina Owok, chieftain of a native tribe which has seen their coffee beans almost double in value in recent years. "We need to encourage and help other communities to produce quality coffee," she said. "We want to pull them up — to improve their standard of living — so they can experience what we have."